The Toad Brigade is a group of five Toads that aid Mario through some games, starting with Super Mario Galaxy. They are led by Captain Toad. Later the group would expand to include Toadette, bringing the membership up to six. Concept art of the Toad Brigade and their Starshroom in Super Mario Galaxy. Enjoying the festivities in Princess Peach's Castle during the Star Festival, a Toad and his friends are scattered across the galaxy after Bowser carries Peach's castle into outer space. They eventually escaped, along with Luigi, until they are separated from him and are later discovered by Mario in the Honeyhive Galaxy, where he rescues them. This picture is sent to the Wii Message Board after Luigi collects 121 Power Stars. Shortly afterwards, the Toads join Mario at the Comet Observatory, where they decide to help him in his quest to gather the Grand Stars, and move their base of operations to the Garage. After the Lumas help them build a spaceship, the Starshroom, the Toads form the Toad Brigade and start traveling in order to find Power Stars with Mario. They are then seen throughout several galaxies in search for the stars, and often cheer Mario on during battles. They often arrive to provide a Launch Star to Mario on their ship in order to help him progress. The five members of the Toad Brigade each have special attributes: the leader is Captain Toad who, despite trying to come off as brave is always fleeing at the first sight of trouble, making up ridiculous excuses along the way. This is first proven at the Space Junk Galaxy, as he mutters that he is afraid to board the airships. He can be seen as rather lazy. He always has a miners light on his head and a backpack on his back. Hint Toad wears glasses and often gives Mario advice in levels. Yellow Toad is very lazy and happy-go-lucky, and is either sleeping, much to the annoyance of a yellow Luma, or spinning around in circles. The green Toad carries a pickaxe and often sings songs while digging with it. The purple Toad is the Mailtoad. He will give Mario letters from Peach or Luigi when received. He also enjoys snorkeling, and can often be found underwater or with a snorkel mask. In the Grand Finale Galaxy, where they show up for the final time, their leader reveals that because of their work in helping Mario retrieve the stars, they have been promoted to Royal Guards. Mario and the Toad Brigade in Bowser Jr.'s Boom Bunker. The Toad Brigade reappears in Super Mario Galaxy 2. Like in the previous game, they continue to aid Mario throughout the different worlds. Mario and the Toads on their Starshroom (the Starship Mario can be seen in the distance). 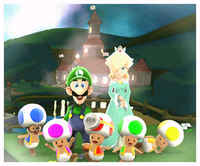 The Toad Brigade is introduced in an alternate manner than in Super Mario Galaxy. Firstly, Captain Toad has the other Toads refer to him as "the new captain," and, when he is first met, he reveals he is actually just a Toad who instated himself as captain simply by wearing a headlamp. Additionally, the Brigade does not seem to know as much about the Lumas as they did before. The Starshroom used in Super Mario Galaxy 2 is stated by brigade members who reveals that the Lumas built it for them so they can return to follow Mario to help him on his quest. Also, they do not talk about their previous exploits and some have different roles in comparison to the original game. For example, the green Toad now is a Banktoad and not an adventurer as he was in the previous game. Additionally, Mario can give Banktoad some of his Star Bits. Throughout the game, the Toad Brigade follows the Starship Mario using their Starshroom. Mario can go onto to their Starshroom simply by using a teleportation pad on the Starship Mario in order to speak with them. There is also a 1-Up Mushroom each time Mario teleports to their ship. They sometimes assist him on his journey but generally they are just seen exploring the areas rather than looking for power stars. In the Bowser levels, the Toads are sometimes seen deep within the area, with the Toads often having a coin for Mario to collect. In the ending credits, the Toads are seen celebrating within the credits as Mario finally gets the cake that he had earned from saving Princess Peach. It is unknown if they still are Royal Guards. Captain Toad also appears in Super Mario 3D World. In this game, he is a playable character in his own puzzle levels called The Adventures of Captain Toad where the player can not jump and must collect five Green Stars. He also appears in several other levels, and awards Mario and the other characters with a Green Star when found. He is the only Toad Brigade member in the game; while yellow, green and purple Toads similar to his crew can be seen with Captain Toad in a Clear Pipe back to the Mushroom Kingdom during the credits, they only act as hosts of the Toad Houses. The Toad Brigade appears once again in Super Mario Odyssey. Mailtoad returns, unlike in Captain Toad: Treasure Tracker, but only as the employee of the regional coin side of Crazy Cap shops; Yellow Toad also appears in the same capacity. Toadette is added to the crew, known in-game as "Archivist Toadette." She rewards the player after they have completed achievements, which they can view by talking to her. Blue Toad is now known as Hint Toad, and will give Mario the locations of Power Moons for fifty coins. Unlike in the Super Mario Galaxy games, Captain Toad is usually in a separate location than the rest of his crew. The Toad Brigade alongside their newly appointed member Toadette at New Donk City in Captain Toad: Treasure Tracker. Captain Toad stars in Captain Toad: Treasure Tracker as a playable main character along with Toadette, who joins the Brigade. All the other members of the Toad Brigade (except for Mailtoad who is absent from the game) also appear in various stages to help the captain, with Hint Toad giving him Super Gems or Super Mushrooms upon being found. Yellow Toad can be found fast asleep in most levels and can additionally cause Captain Toad to fall asleep if he were to stand near the sleeping toad. Banktoad meanwhile is seen studying a map in most of his appearances throughout the game. The appearance of the Toads are vastly different from past games, as they are outfitted in explorer outfits with backpacks similar to Captain Toad's redesign from Super Mario 3D World. Captain Toad meeting the Toad Brigade in Plucky Pass Beginnings (3DS). 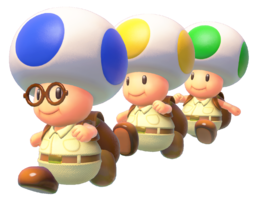 The three other Toad Brigade members also appear in the first set of levels in the bonus stages. In these stages, the goal is for Captain Toad to find the three Toads scattered around the stage and lead them to a platform that only lifts once four characters are standing on it to reach the Power Star. If any of the other Toad Brigade members are hit by an enemy, however, the player automatically loses a life rather than the Toad turning into a small form akin to Captain Toad and Toadette. The Toad Brigade members also make cameos in the beginning of the Challenge levels, ending of the Mummy-Me levels and in the credits. Captain Toad appears in Super Smash Bros. Ultimate, functioning as a background element in New Donk City Hall. Captain Toad can be seen standing on top of a building, in addition to sometimes appearing in the Odyssey. Captain Toad also appears as the enhanced form of Toad's spirit. Toadette also appears, donning her explorer's outfit. She is a master spirit, leading expeditions in the temple area. Toadette's expeditions take 2 hours to complete; thus, players have to check her expeditions the most frequently. Captain Toad, also known as Toad Brigade Captain in Super Mario Galaxy and Super Mario Galaxy 2, is the leader of the Toad Brigade. He often wears a headlamp on his head while exploring the galaxies and is seen being in charge. As a result of this, he is sometimes seen fixing things such as their ship that broke in the events of Super Mario Galaxy. In both games he is portrayed as a little bit afraid of the challenges, though his loyalty to Princess Peach encourages him to keep helping Mario throughout his adventure. His level of cowardice varies between these games; while in Super Mario Galaxy he leaves himself behind so that the rest of the Brigade can do the work, in Super Mario Galaxy 2 he is a more active and bold (though still afraid) member to get into dangerous situations. In Super Mario 3D World, he has a playable role dedicated to finding Green Stars. He stars in Captain Toad: Treasure Tracker as the main playable character and protagonist. Here, he is given a more greedy side but keeps his cowardice and loyal attitude. He ventures to save Toadette from Wingo, and is later captured by Wingo as well, only to be saved by Toadette. He reappears in Super Mario Odyssey with the rest of his crew, but usually separate, waiting to give a Power Moon to Mario when he finds him. Archivist Toadette, casually known as Toadette is the sixth member of the Toad Brigade. She joined the Toad Brigade in the events of Captain Toad: Treasure Tracker. While treasure hunting with Captain Toad, Wingo appears and grabs the Power Star the Toads just retrieved. While the Captain gets knocked over, she tries to grab back the Power Star, but fails; instead, Wingo flies away with both the Star and Toadette. After a long journey, Captain Toad arrives at Wingo's Watchtower, defeats Wingo and saves Toadette, retrieving another Power Star in the process. She co-stars in Captain Toad: Treasure Tracker as a playable character and the deuteragonist in the game. Here, she's Captain Toad's partner and she is saved by him from Wingo and later saves him from Wingo later in the game. Toadette officially becomes the sixth member of the Toad Brigade during the events of Super Mario Odyssey where she's the team's archivist. As the archivist, she tells Mario about achievements and hands Power Moons out when he completes them. Hint Toad is portrayed as the smartest member of the Toad Brigade. He wears glasses that can be seen in the Super Mario Galaxy series. Hint Toad often gives Mario advice throughout the levels. His information is the most helpful out of all the Toads. Hint Toad also seems to not be very trusting of the Lumas and Rosalina, even declaring that she might be a witch. He eventually sees them as his allies after Mario clears the Terrace. In Captain Toad: Treasure Tracker, Hint Toad assists in more ways than before. Instead of offering advice, he now gives Super Mushrooms, 1-Up Mushrooms, and even Super Gems, apart from in the bonus levels, where he is the first to follow Captain Toad. In Super Mario Odyssey, he tells Mario Power Moon locations for fifty coins. Yellow Toad is a sleepy Toad. In Super Mario Galaxy he is seen sleeping any time he could, going as far as never appearing awake in Captain Toad: Treasure Tracker, apart from in the bonus levels. While awake, his actions are very cheerful and mostly carefree. He is seen spinning and having fun very often. In Super Mario Galaxy 2, he seems to be awake more often as well as somewhat more serious. While Yellow Toad sleeps, he often mentions events that have not taken place yet, such as telling the player when they need Coins or Star Bits. This may imply that he can see the future in his dreams, and he is often more helpful sleeping than otherwise. In Super Mario Odyssey, his role is diminished, being only an employee for Crazy Cap. In Super Mario Galaxy, Green Toad is a humble hard worker who loves to sing songs as well as build and fix things, especially with his picket. In Super Mario Galaxy 2, he is named Banktoad and given a new occupation as a Star Bit banker. Mario and Luigi can come up to him to give or take Star Bits. Banktoad spends his time looking for Star Bits for Mario and Luigi. His appearance changes when he is holding a certain number of Star Bits. He is also not as humble as seen in Super Mario Galaxy, as he sometimes questions or criticizes the competence of his Captain. In Captain Toad: Treasure Tracker, he is always seen reading an old map, apart from in the bonus levels. In Super Mario Odyssey, he claims to be opening a Crazy Cap store on Forgotten Isle. Mailtoad is the purple Toad in both Super Mario Galaxy and its sequel. He enjoys giving mail to Mario. Letters come from Princess Peach, Rosalina, and others. Most letters in Super Mario Galaxy are letters attached with 1-Up Mushrooms or from Luigi when he finds a Power Star for Mario; however, in Super Mario Galaxy 2, there are letters from people in the galaxies that want challenges, such as The Chimp. In Super Mario Galaxy, he is also found as a brave explorer and a risk taker. He is often found swimming or after swimming in Purple Coin missions, telling Mario if he has found any Purple Coins in the water. He is willing to take risks to help Mario, as he has even swum in the freezing waters of the Freezeflame Galaxy to look for Purple Coins. In Super Mario Odyssey, he is an employee for Crazy Cap. Wii Super Mario Galaxy 2 As Mario travels to the unknown reaches of space, he can always rely on the trusty Toad Brigade. They're a colorful bunch–the captain sports red spots while the others have green, yellow, blue, or purple ones. The yellow one is known for dozing off on the job, but his sleepy musings can be quite handy! In Sand Spiral Galaxy, a generic red Toad is seen near the entrance with a Boo Mushroom. However, the only red Toad in the Brigade is Captain Toad, who is always seen wearing his headlamp and backpack. Similarly, in the Lost Kingdom, a blue Toad wearing the Toad Brigade attire can be found near Talkatoo; however, the only blue Toad in the Brigade is Hint Toad, who is seen in the beginning of the stage instead and always wears glasses, unlike this Toad. This page was last edited on March 9, 2019, at 00:15.